With spooky season upon us, people of all ages have started craving fall festivities more and more. From carving pumpkins so early in October that they rot well before Halloween, to downing hundreds of PSL’s, anyone and everyone is searching for their perfect fall fix. With these autumn cravings comes the imperative need for the perfect scary movie. However, those who are interested in the new Goosebumps movie sequel, “Goosebumps 2: Haunted Halloween,” should keep searching for that perfect scary flick, because this is not it. What seemed like a fun take on the classic short novels that we all know and love, turned out to be a dull film that belongs buried under the other boring holiday movies at the five-dollar CD bin in Walmart. I don’t mean to sound harsh, I just had pretty high expectations for the movie, which was probably my first mistake, considering that it is a film meant for children. It starts off with your basic characters: Sarah, (Madison Iseman) a senior in high school and aspiring writer, her brother Sonny (Jeremy Ray Taylor), and Sonny’s friend, Sam (Caleel Harris). After a cast introduction, we follow the two boys into a haunted house, where they find Slappy, the living ventriloquist dummy, straight out of R.L. Stine’s “Night of the Living Dummy.” This part I liked, being someone who read almost all of Stine’s books as a kid. From there, the dummy proceeds to take over the painfully suburban town and make all the Halloween decorations come alive through the use of an R.L. Stine’s novel and Nikola Tesla’s electrical tower (don’t ask). The beginning of the movie was promising, with a talented cast and surprisingly accurate depiction of Slappy, but quickly turned into an hour of the young cast screaming and running away from the dummy’s Halloween henchmen. Overall, the movie was really missing one major element— the scare factor. Of course, I didn’t expect it to be too frightening because of its targeted audience, but the whole point of the Goosebumps series is that they are meant for kids, but still scary. This did not come across at all in the movie. 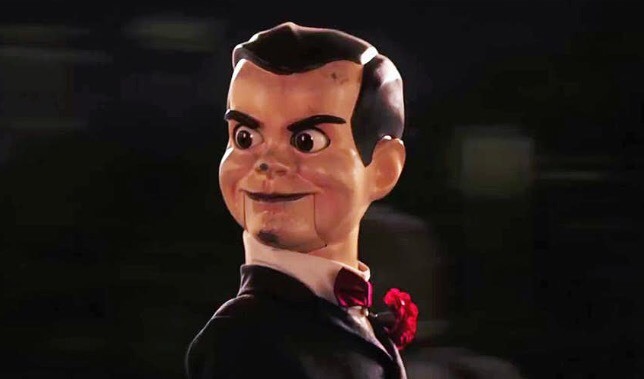 At the end of the film, the audience finds out that Slappy’s primary motivation for terrorizing the town was that he wanted to have a family, which is the least scary motive the directors could have possibly thought of. Why would a maniacal doll’s foremost concern be finding a loving and caring family? It doesn’t add up. A spooky movie without the spook just is not worth seeing. “Goosebumps 2: Haunted Halloween” was definitely a bust and was a severe downgrade from its surprisingly decent prequel. The only audience I can imagine this movie captivating are young kids with a very low tolerance for horror, but I guess that was its true purpose all along.